When you’re out on the job site working in mud, rock, scree, gravel, and more, we know you’d rather be kicking up your feet in your favorite recliner rather than kicking up that stuff on your shift. While we can’t bring the comfort of your arm chair to you, w ... (see full details) (see specifications) #1015401. When you’re out on the job site working in mud, rock, scree, gravel, and more, we know you’d rather be kicking up your feet in your favorite recliner rather than kicking up that stuff on your shift. While we can’t bring the comfort of your arm chair to you, we can make sure your feet are comfortable and safe in a pair of high-quality, long-lasting work boots. These abrasion-resistant KEEN Utility Men’s 1015401 Steel Toe Brown Louisville 6-Inch EH Waterproof Work Boots from KEEN Utility are made for the really tough job sites, with all of the comfort of your favorite KEEN Utility recreational footwear built right into this design. If you know KEEN Utility , it’s probably from sandals or hiking boots made for fun outdoors. It makes perfect sense then for this company to bring that lightweight, flexible comfort and beef it up a bit for the work industry for heavy-duty comfort when you need it. The oil- and slip-resistant rubber outsoles are made tough enough to resistant the abrasive surfaces you work on each day. Meeting or exceeding the ASTM F1677-96 Mark II non-slip testing standards, these outsoles keep you moving confidently through whatever your job puts in front of you. With the steel toe caps, these Louisville brown boots also meet ASTM F2412-11 and F2413011 I/75 C.75 EH standards for safety on the job site. When you spend a lot of time on your feet, it really matters what you have on your feet during the day. Finding balance between protection and comfort can be tough, but not with KEEN Utility shoes. 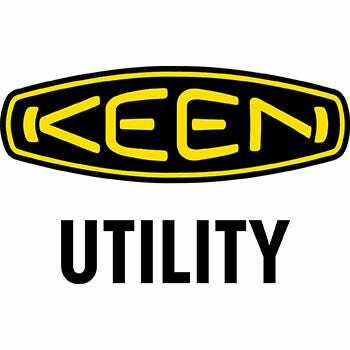 You can enjoy the best of both worlds, thanks to the detailed design of KEEN Utility boots. These heavy-duty leather men's boots feature waterproof full-grain leather uppers with tough-tec leather. The full-grain resists abrasions naturally and comes from the toughest cut of hide, while still maintaining enough flexibility to keep you comfortable on the job. Backed with KEEN.Dry membrane waterproof technology, your sweat vapors can escape, while moisture cannot penetrate, for cooler, drier feet from the inside out. The metallic hardware is tough enough to survive the heat, cold, and just about whatever else your job throws at your waterproof steel toe boots. Padded collars and tongues ensure a comfortable fit around your ankles with these 8-inch work boots. The patented KEEN Utility rubber toe guard is signature to all KEEN Utility shoes and boots and specifically designed to protect this high-wear area of your safety toe EH boots for a longer lifespan built right into the design. Inside, your feet will enjoy the anatomically correct support and comfort KEEN Utility boots provide. The removable metatomical dual-density EVA footbeds are made to cradle the contours of your feet, providing extra arch support and added cushion that fits just right. The asymmetrical steel toe caps are roomier than standard styles, made specifically for left-foot/right-foot fit. Beneath it all, compression molded EVA midsoles absorb shock so your feet don’t have to. With each step, your feet experience pain and fatigue caused by the shock of impact with the ground. With these midsoles in place, you feel less of it which reduces your stress and increases your stamina. The flexible TPU shanks protect your feet and stabilize your steps from the bottom up as well. The oil- and slip-resistant rubber outsoles are made tough enough to resistant the abrasive surfaces you work on each day. Meeting or exceeding the ASTM F1677-96 Mark II non-slip testing standards, these outsoles keep you moving confidently through whatever your job puts in front of you. With the steel toe caps, these Louisville brown boots also meet ASTM F2412-11 and F2413011 I/75 C.75 EH standards for safety on the job site. So when you want tough, need safe, and desire comfort, this brand has the whole package ready to work for you with these KEEN Utility Men’s 1015401 Brown Louisville 6-Inch EH Steel Toe Waterproof Work Boots from Working Person's Store. KEEN Utility Boots: Men's 1015401 Steel Toe Brown Waterproof Louisville 6-Inch Work Boots is being added to your cart.